A little government intrusion on liberty never hurt anyone. Photo credit: DonkeyHotey / WhoWhatWhy (CC BY-SA 2.0) See complete attribution below. In spite of rampant hypocrisy in politics, it is understood where the parties and their leaders stand on certain issues. Republicans are not going to give an inch on things like guns and abortion, Democrats are not going to outlaw unions, and Bernie Sanders won’t support the privatization of Medicare. And then there is Rand Paul. The son of former congressman and Libertarian icon Ron Paul, Rand rode daddy’s coattails to the Senate in 2010 — at the height of his father’s popularity. Once elected, he often pretended to share the elder Paul’s ideology when it suited him. But when push comes to shove, he is only principled about looking out for himself, which is why we think he could best be described as an Opportunitarian. His MO seems to mainly consist of making some grand statement in an effort to get the national media to pay attention to him… just to quietly walk back his grandiose words later. Earlier this year, for example, he threatened to vote against Mike Pompeo as secretary of state. In fact, he said he would do “whatever it takes” to stop Pompeo’s nomination and that of Gina Haspel as CIA director. In Pompeo’s case, this was a particularly big deal because Paul is a member of the Foreign Relations Committee and his “no” vote would have meant that Pompeo would not have been reported favorably out of committee. In the end, however, Paul caved and he supported the nomination. He did vote against Haspel but certainly did not do “whatever it takes” to stop her from heading the CIA. Paul then did the same thing again in July, when he pretended that he was “honestly undecided” on whether to support the nomination of Brett Kavanaugh, Trump’s choice to fill the Supreme Court vacancy. Guess what happened! After scoring a few headlines he caved again — although “cave” would indicate that he was serious in the first place about taking a principled stand against Kavanaugh. In the end, maybe he just wanted another golf date with Trump. The two are certainly an odd couple. On the one hand, you have a president who has authoritarian tendencies and on the other a senator who sometimes pretends to be a Libertarian. Perhaps Paul just likes authoritarian regimes. Last month he visited Russia and delivered a letter from Trump to President Vladimir Putin. The senator was also one of the only people outside of Moscow who believes that the Helsinki summit wasn’t a total disaster for the US president. That alone would make Paul one of Trump’s favorite people. But to further ingratiate himself to the president, Paul did something last week that would make any true Libertarian’s skin crawl: he suggested that senior administration officials should be forced to take lie detector tests to determine who wrote an op-ed describing Trump as an imbecile, i.e., the way most of the world views him already. If you would list Libertarian ideas, forcing people to take a lie detector test for having written a newspaper column probably ranks fairly low. So what the hell is Paul doing? It’s certainly not being a Libertarian. A good guess is that he realizes that the GOP is entirely Trump’s party now and, if he ever wants the top job himself, which he does, then he will need the president’s support. In other words, he is being an Opportunitarian again. 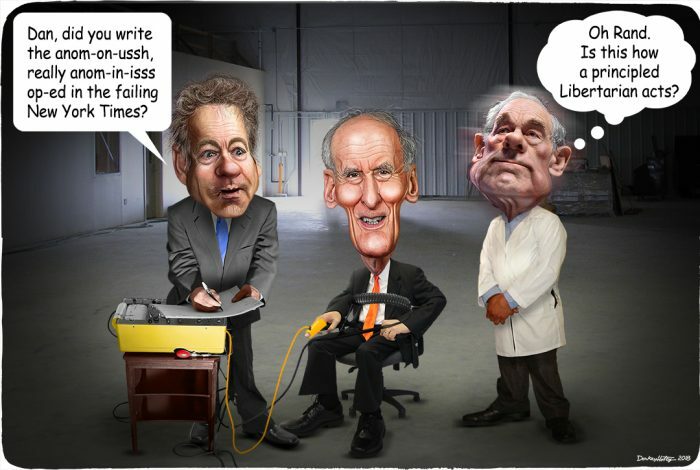 The cartoon above was created by DonkeyHotey for WhoWhatWhy from these images: Rand Paul caricature (DonkeyHotey / Flickr – CC BY 2.0), Ron Paul caricature (DonkeyHotey / Flickr – CC BY-SA 2.0), Dan Coats caricature (DonkeyHotey / Flickr – CC BY 2.0), lie detector (Tullio Saba / Flickr Public – Domain Mark 1.0), doctor (German Tenorio / Flickr – CC BY-SA 2.0), and room (U.S. Department of Energy / Flickr).